Durable all-metal construction brings solid performance to your daily stapling needs. Staples up to 20 sheets. Positive locking latch. Inner rail for jam-resistant stability. Offers the versatility of stapling, pinning and tacking. Nonskid base. 4 Inch throat depth. Open channel loading of a full strip (210) of standard staples. 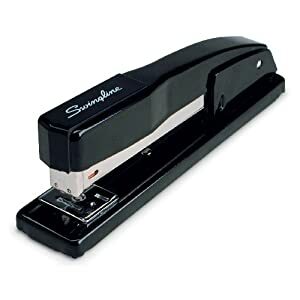 Order now and Get 67% off Swingline Commercial Desk Stapler.